Women’s blouses are a wardrobe staple, whether you’re spending a day at the office or heading to lunch with friends. A tailored blouse makes the perfect pairing with classic trousers or an elegant skirt, creating both versatility and style. After listening to customers’ needs, Marilyn Hellman, owner of the European fashion boutique Marilyn’s in Naples, Florida, created a signature collection of blouses for women to flatter every figure. Here, she shares the most lovely shapes and styles to liven up your look. On your next shopping excursion, look for blouses with structure. These pieces sculpt the body, so they’re more figure-flattering than straight, boxy styles. The key is finding the right fit for your body type; Marilyn’s blouse collection offers various amounts of taper, from a slight fit to a close, body-skimming shape. Her blouses are designed with a darted bust line, tapered side seams, and additional bodice darts to create a classic hourglass shape. Among the various shapes in Marilyn’s collection there are classic fitted shirt styles with front and back darts, shirts with yokes at the top, blouses with various panels for a sculpted fit, short fitted blouses with princess seams, long blouses that fit at the top and flair out at the hip, long close fit blouses and relaxed fit blouses of various lengths. There are optional sleeve styles to suit any woman’s taste. 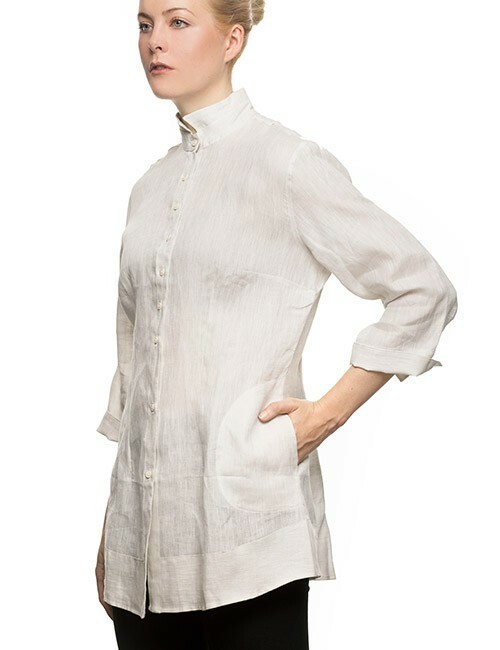 The Marilyn Blouse Collection offers 100% cotton styles, 100% linen styles, and a comfortable 95% cotton, 5% elastic blend that offers some stretch. Each piece is made in Italy with quality fabrics—the collection is available in whites, stripes, and prints. Most of the blouses also feature easy care; wash in cool water and hang to dry. Marilyn created this collection by listening to customer needs. Many women feel uncomfortable in sleeveless blouses, for instance, so her styles feature multiple options: cap sleeves, ¾ sleeves, and long sleeves. She also offers zipper-front styles for customers who dislike buttoning up. Shoppers have also asked for different lengths, so Marilyn includes short, medium, long, and extra-long blouses to suit every woman’s personal style. If you’re seeking women’s blouses that flatter your figure, shop Marilyn’s new collection online. The local boutique provides the ultimate luxury shopping experience, with exclusive European fashion you can’t find anywhere else. Always on top of the trends, owner Marilyn Hellman hosts popular how-to videos on her YouTube Channel, sharing must-have fashion tips.